After many months of thinking and research, the time has arrived when I have moved onto my next scope. 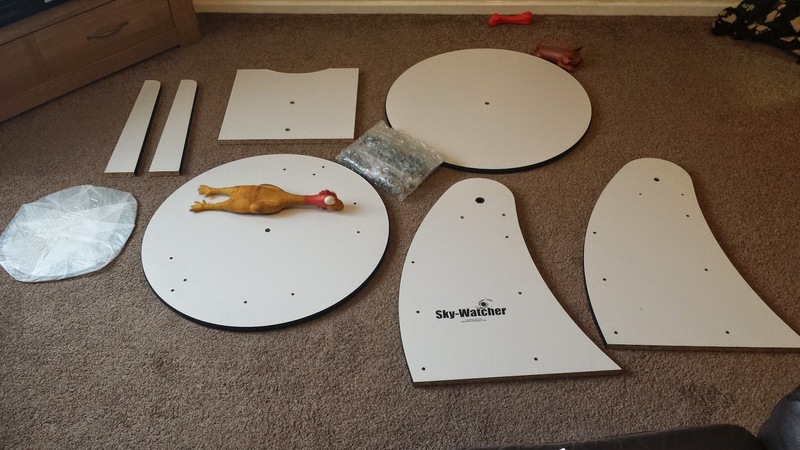 Just over two years ago, I bought my Skywatcher 150p which has been an excellent first purchase. I doubt I will ever get rid of it because it gives me a reasonable travel options for putting in the car when going on holiday etc. But, there comes a time when aperture fever takes over, and a turn to the dark side is made. That dark side, is, THE DOB MOB! The decision process has been a varied journey. Just when I thought I had made my mind up, then I would read another review, and I would change my mind. 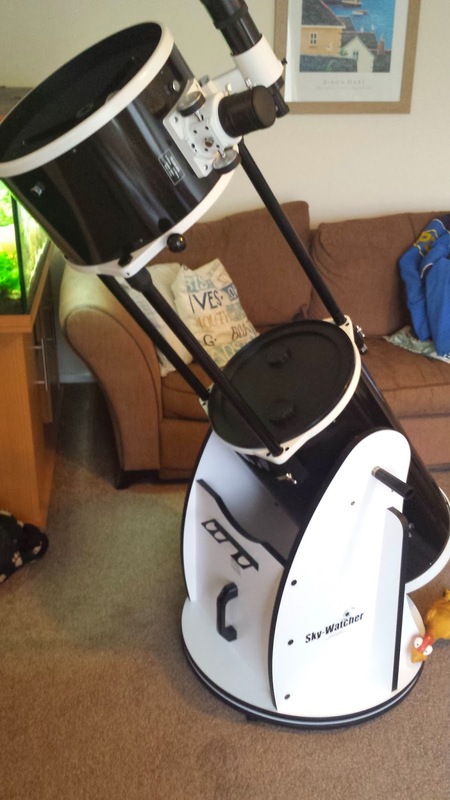 Eventually, after a visit to Tring Astronomy Centre and a plethora of emails back and forth Neil and Jane, I eventually decide on the Skywatcher Flextube 300p Dobsonian telescope. So, this is my attempt at a first impressions, come unboxing, come initial review of the SBT. 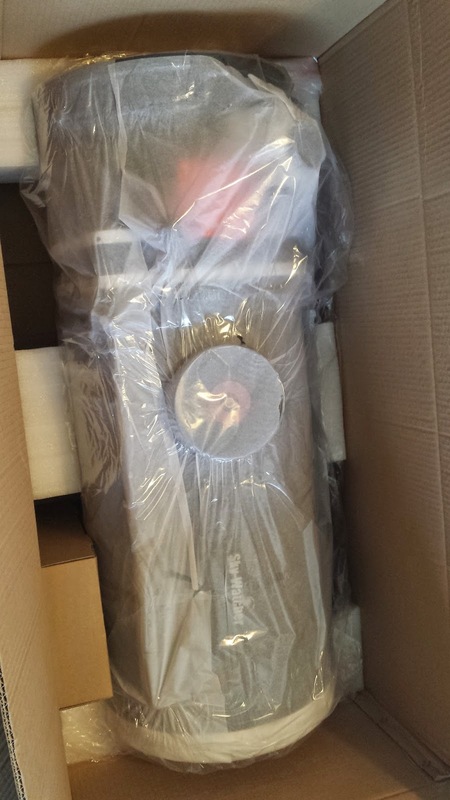 The scope was delivered in two quite large boxes. 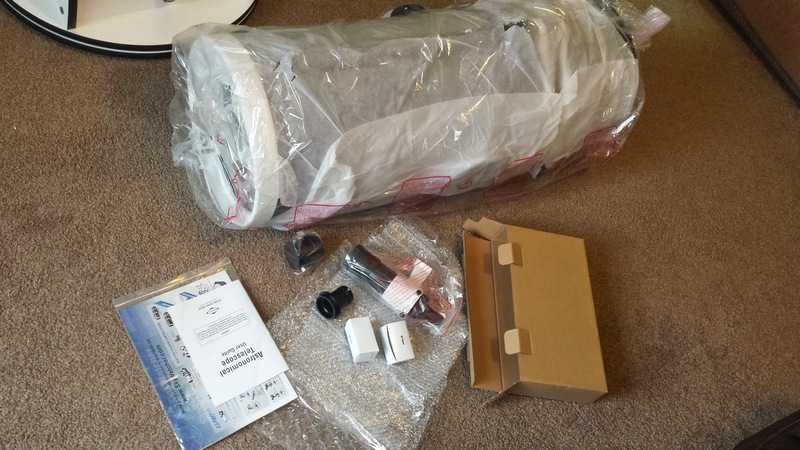 One flat pack containing all the components of the dobsonian mount, and the second containing the tube assembly. There was some superficial damage on the boxes, but I guess they are the protective packaging. Glad to report that nothing was damaged. 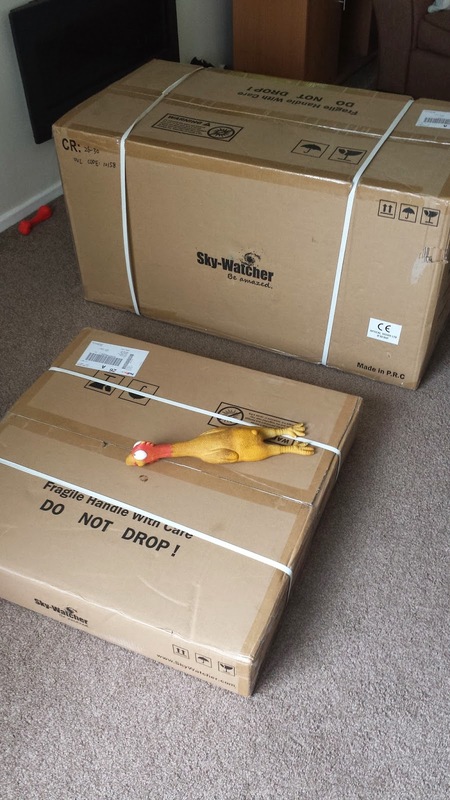 Rubber chicken not included. The mount is the first thing that needs to be put together, so I opened this box first. As part of my research, I learnt that the instructions that come with the scope were not supposed to be as good as the ones available online. So, in preparation, I printed out the instructions before the scope had arrived and used those. I checked through the component list to make sure that all parts were present and correct. I would say that the tools supplied with the flat pack are adequate for the job, but most people would have better tools available in their toolbox. 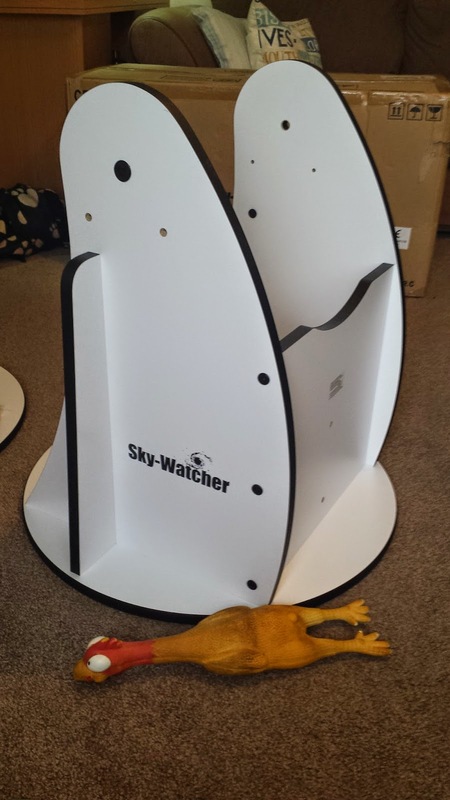 The base is made from chipboard, laminated in white with the Skywatcher logo present on each side of the base. During my research, I read some reviews from users who had concerns about moisture penetrating the chipboard. Whether it happens to my mount or not, only time will tell, but the laminate is sealed on the edges very well, and very durable to the scratch, so providing I take good care of it, the mount should last me for the lifetime of the scope. 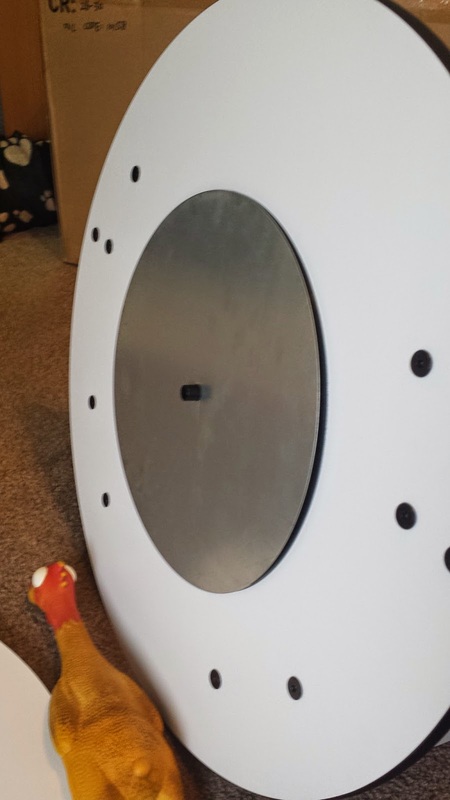 All the holes used for constructing the base are pre-drilled and I must say, are very accurate. Over the years, I've put together plenty of flat pack furniture, and sometimes, our Swedish friends aren't always that accurate with their drilling techniques shall we say. This is certainly not the case with the mount. All the holes married up perfectly and the screw fittings bit into the pre-drilled holes very well. I did have a concern at one point in case the diameter of the screws caused the chipboard to bulge, by my concerns were unnecessary. The final section to the mount construction is the fitting of the turntable. It is an incredibly simple yet efficient design. The first thing to do was to attach the 3 small rubber feet to the base. Previously, there has been an issue according to some review that the screws used to do this were too long and pierced the surface the other side. However, this has seemingly been addressed with at least 1/4" left. 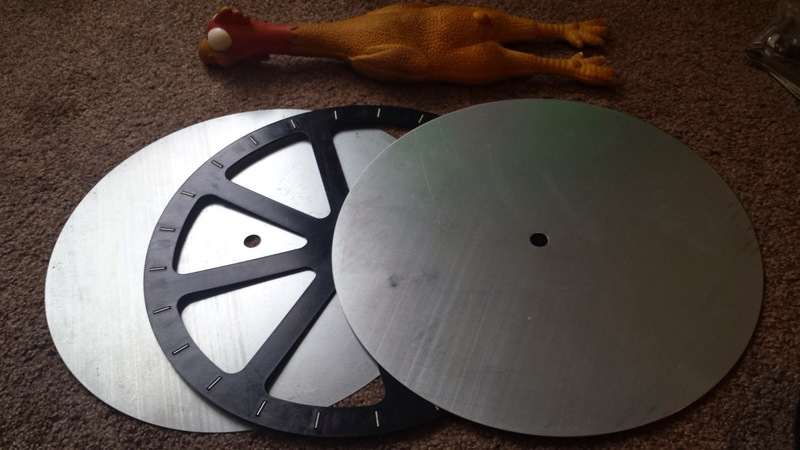 The turntable sits on a plastic type pad with cylindrical bearings sandwiched in between two circular aluminium discs. It could be an option to add some lithium grease to these bearings, but for the time being I have left them as was out of the box. The bearing, the base and the rest of the mount are all aligned through a single central hold drilled through all the components and lined with a short plastic tube. Then, a single bolt is pushed through with a locking nut used to tighten the whole assembly together. 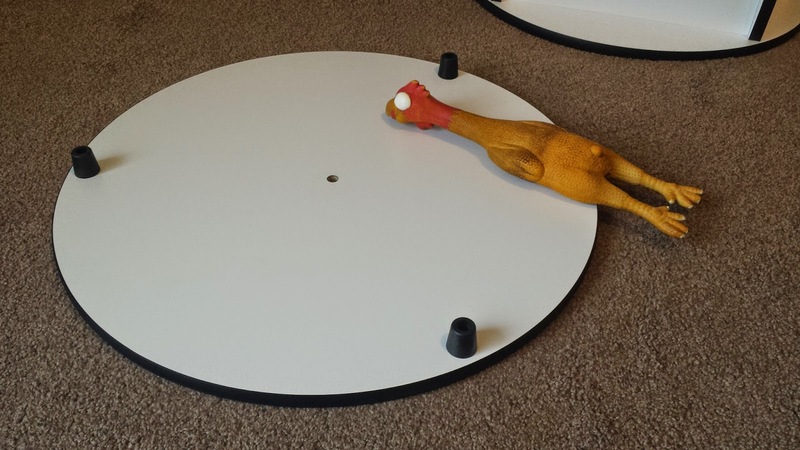 And so, with the addition of the eyepiece holder and font handle, the construction of the base was complete. It's solid, it's smooth and looks to be well designed. Finally, 4 nylon bearings are fitted on the inner side of each part of the mount. These are the bearing that will hold the tube assembly when it is dropped into place. So, the next step in the build process is the tube assembly. Inside the box was the tube itself, along with a smaller box containing the stock eyepieces, focuser adapters and right at the bottom, the instructions. It seems a little odd putting the instructions at the bottom of the second box, but I suppose usually people empty everything first if they have the space. Before I pulled the tube out, I took a look at the stock eyepieces that come with it. They are the standard 10mm and 25mm eyepieces that come with many Skywatcher telescopes. In comparison to the ones that came with my 150p, they are similar, perhaps built a bit better, but standard none the less. Also in the little box was the stock finder scope. To attach the tube assembly requires lifting the tube onto the mount and resting the tube on the nylon bearings. These support the tube on their own accord. I needed to make sure that the tube was put onto the mount with the focuser on the correct side for your preferred side of viewing. Once the tube assembly is sitting on the nylon bearings, the holes for the tension control handle and other handle line up perfectly to allow you to screw in the two handles into the side of the tube. That, in essence, is the main build part of the scope. All that remains is to extend the tube and fit the finder scope. The scope comes with two covers. 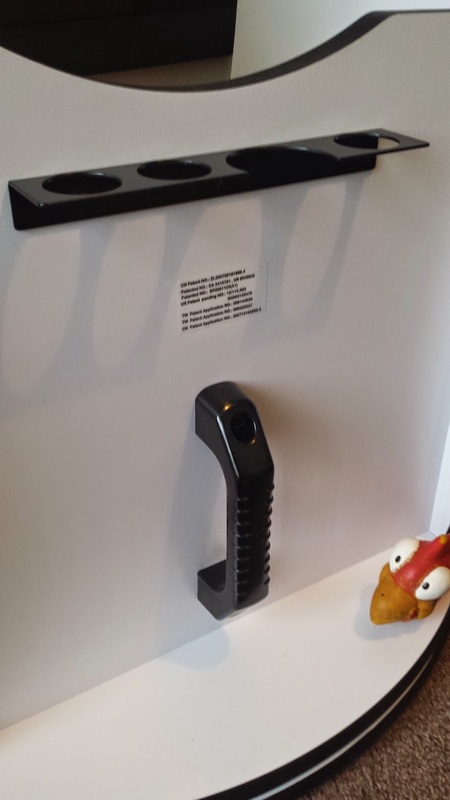 The first is a shower-cap type cover over the top of the secondary mirror as modeled by the rubber chicken. I don't think this will last too long and is perhaps just for transport. I think that I will find alternative protection in the future. To bring the tube to it's full length, there are 3 thumb screws at the bottom of each of the truss supports. These need to be loosened, and then the top section can be lifted to extend the trusses to their full length. Small catches click into place once the full height is reached. The thumbscrews can then be tightened again to avoid the secondary mirror sliding back down. One of my initial concerns when first considering this scope instead of others was how strong the trusses were. I was concerned that there would be an element of twist between to top and bottom sections. However, after seeing a similar model in the shop at Tring Astronomy, and now having my own, these concerns were quickly dealt with. Again, the tube and truss support construction are very strong, and I could detect any circular or twisting movement. If I could, it would mean collimation would be incredibly hard, almost impossible, to maintain. 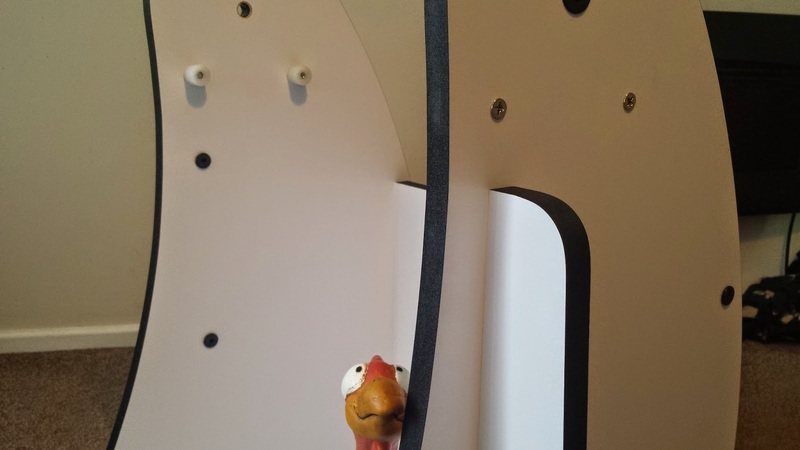 Speaking of collimation, this was the last thing that I did in the build section. 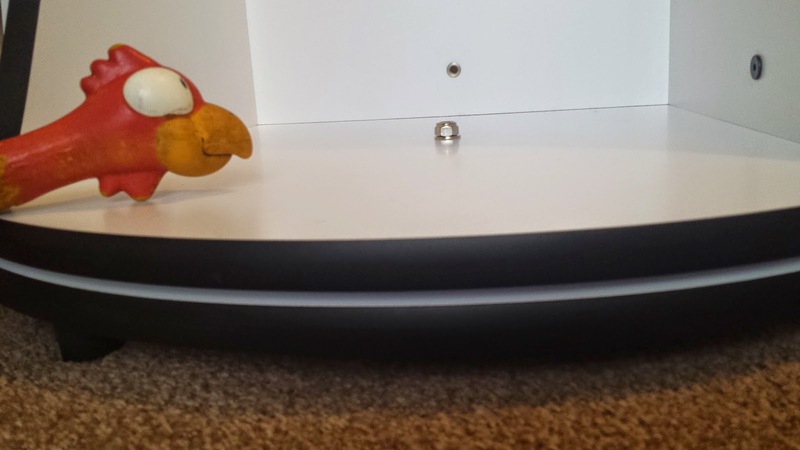 I used my cheshire collimater and then my laser collimator to check. Collimation wasn't far out at all and just required a quick tweak of the primary to bring the red laser dot onto target. It was whilst doing this that I came across the trickiest part of the build. Two out of three of the collimation screws were turning quite readily. However, the third was incredibly tight. It took a great deal of fiddling, and even a Leatherman tool to try and loosen it off. I could see that is was tightened right up as the spring between the bottom of the scope and the mirror was fully compressed. The collimation screws themselves are well designed and nice and big, so I didn't have much concern about trying too hard. Finally, with the help of my left sock wrapped around my hand, I eventually managed to loosed the screw off. It was still quite hard to turn at first, but I spent 5 minutes or so turning the screw back and forth, and eventually it loosened off nicely. That was, quite literally the only sticking point in the whole process. In summary, before first light, do I like the scope? No, I don't. I love it! I am so glad I got it and I look forward to getting it out for first light. Is there much more to say about the scope? Yes, huge amounts. 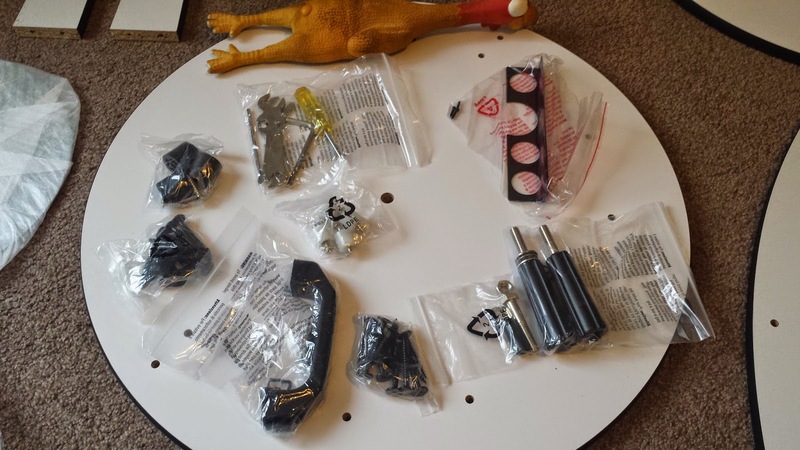 There are upgrades to be done that will get mentioned in the DIY section. There's first light. There's building some storage for it. 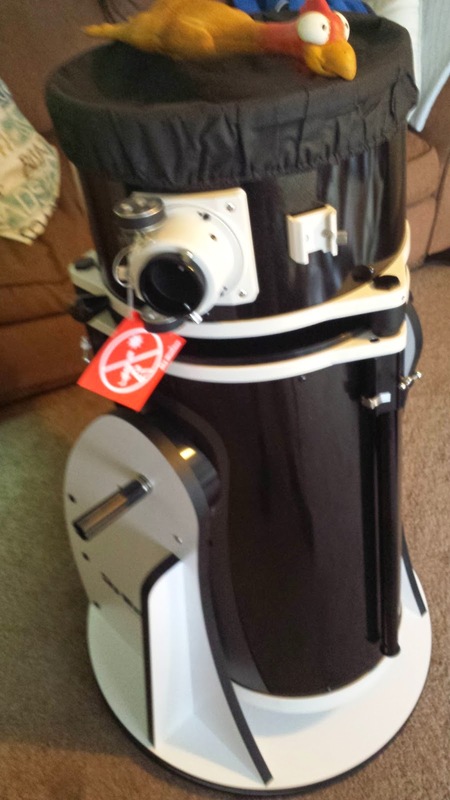 There's the inevitable purchase of a shroud and possibly more eyepieces. All in due course.